I'm back, albeit a little late this year...Lot's of moving parts with the new playoff format, so I will work on incorporating everything into here...As always, if there are any special requests, or if anybody notices any mistakes, let me know. Best thread of the year. Thanks, yet again, for doing this dude. Hmm. Boston with 9 on the road of 13, Pens with 9 at home out of 14 left. Might not be quite as much a longshot as I thought. Made a mental note to look for this thread/site while at work today! Right on time! Love it! It's officially March and close to playoff season. I care more about not playing Philly than getting first in the conference. Is a PHI-BOS round one series a possibility? That'd be delightful. 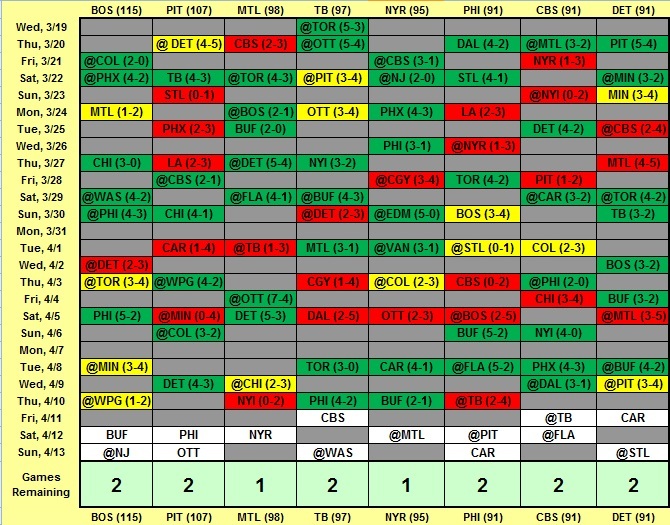 By the way I'm reading it PHI needs to backslide into whichever wildcard slot goes up against BOS. Amusing that if it started today it would be PHI-NYR despite them being 6/7 in the East. WEIRD. dodint wrote: Is a PHI-BOS round one series a possibility? That'd be delightful. By the way I'm reading it PHI needs to backslide into whichever wildcard slot goes up against BOS. Yes, Boston as division winner would play one of the two wildcards, we'd play the other. So if Boston were #1 and Philly dropped to #8 (or Boston ended #2 and Philly #7), they would meet in round 1. Then, IIRC, if Philly won, they'd stay on that side of the bracket and play the winner of the Atlantic #2/#3 seeds. I've got a funny feeling the road to the cup goes through Philly and Boston, which is tough for us. It is what it is though and anything can happen, so for now I just want to look at the first round. Injuries or no, I don't want to play a Mike Babcock coached team in the first round, though maybe it would force the pens to play a smart, disciplined game, which is good. Philly brings out the worst in us and I want no part of those goons. I know Columbus is playing well as of late, but we have had their goat for a long time and would pack the house for games at their building. Just the idea of building a Pens - Jackets rivalry makes me excited. I would love to go see a Pens playoff game in Ohio. 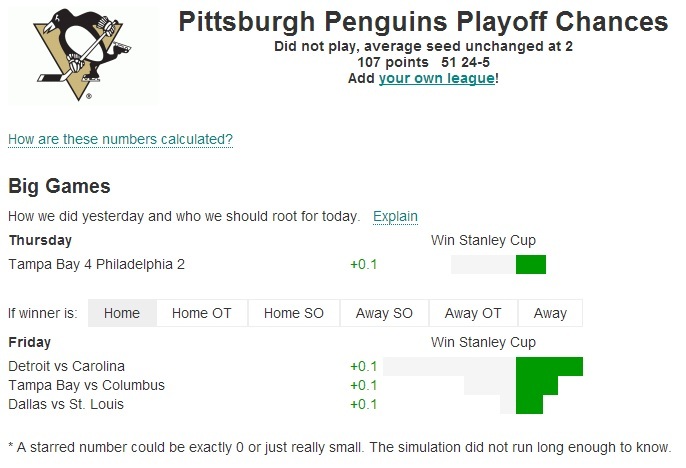 Now, I would also like to see Toronto simply because if they can stay in the playoffs, I think their style of play lends itself to a Penguins victory in that series. But screw it. There is no easy way to the cup. We'll probably end up playing Detroit, Philly, and Boston. This thread adds value to my LGP experience. Thanks for the update. With Boston's win today, I'd say they are pretty good to locking up the Eastern Conference. The Bruins are also on their way to the President's Trophy. I don't think the Penguins can catch them. We'll have to be content with the #2 seed in the East.